San Pedro hums with the sound of golf carts. They add to the charm and beauty of “La Isla Bonita” and provide necessary transportation to visitors and locals. However, along with the electric powered vehicle, comes the dilemma of spent and warn out batteries. Three years ago more than five-thousand used vehicle, marine and golf cart batteries littered the island. The San Pedro Town Council had collected hundreds, but were faced with the dilemma of how to dispose of them. 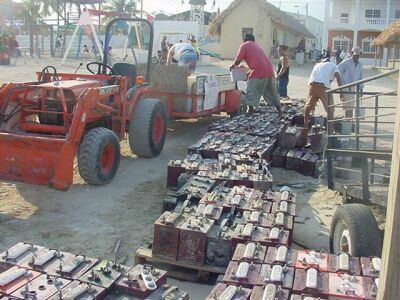 One of the first projects taken on by the Ambergris Caye Chamber of Commerce (ACCC) was to help dispose of these batteries. 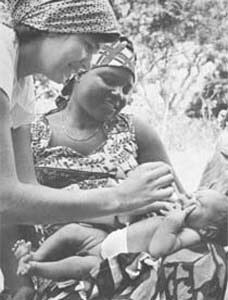 Luckily, Rick and Stephanie Dalton arrived in San Pedro as part of their Peace Corps assignment. They teamed up with the Chamber, the Town Council and many other interested individuals and over the past six months helped to remove most of the batteries from the island. “It was a real team effort,” Rick told The San Pedro Sun. He reflected that many hurdles needed to be overcome to get the job accomplished. First the batteries needed to be collected. Most of the batteries were stored at the San Pedro Town “barracks.” Then they needed to find a way to get the batteries off of the island. Krystal/Mash Shipping offered to use their barges and trucks for this task. Then, it was necessary to find someone who would take the old batteries. At first, Renco a battery factory in Belize City, agreed to take the batteries, but they would only take one truck load of around 150 batteries per week. For the past few months, a company from Guatamala has been taking the batteries and will take as many that can be sent, as long as the batteries are shipped on pallets. Although many of the old batteries are gone, the job is not over. “Now it’s a matter of maintenance,” stresses Dalton. Residents of San Pedro Town are encouraged to discard old batteries at the town barracks. It is hoped that some day a regular schedule can be arranged to pick up used batteries through out the community. Automobile, golf cart and marine batteries pose a health risk if they are improperly disposed. The lead in these batteries, in particular, is extremely toxic, and has been found to be responsible for low IQ’s in developing children. Today, recycling the lead is the recommended course of action for communities to rid themselves of this byproduct.